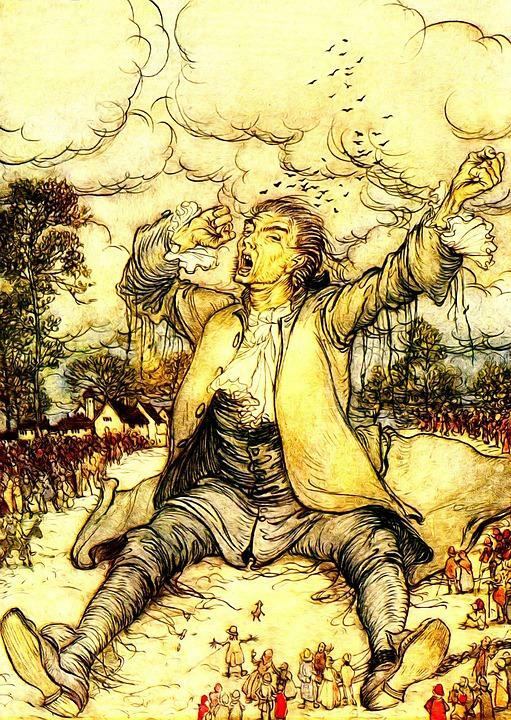 Illustration by Arthur Rackham from a vintage copy of "Gulliver's Travels"
Welcome back to Gulliver’s Travels Week on Kids Commute - classical music appreciation for kids - from Interlochen Public Radio! This week we’re learning about Lilliputians, the people of Blefescu and the Brobingnagians; all wonderful characters from Jonathan Swift’s humorous book “Gulliver’s Travels.” We’re covering highlights of the story through the music of both Bernard Hermann and Georg Philipp Telemann. And we didn’t forget about this week’s Kids Commute Quizlet. Text us the correct answer, and we’ll send you a Kids Commute Prize Pack. In today’s show, we hear about Lemuel Gulliver’s encounter with a king who wants to play chess to win. Can you imagine getting to play chess with a king? What kind of king do you think it will be? A kind and fun-loving king or a king who always wants to win no matter what? We’ll answer those questions plus give you another hint for this week’s Kids Commute Quizlet right after the music.